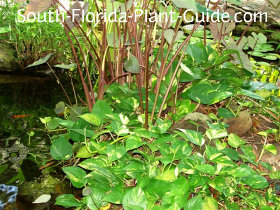 Tame little houseplant golden pothos works its magic in South Florida as a showy shade-loving groundcover or climbing trees and growing huge leaves. The yellow and green marbled foliage creates bright color as a groundcover for shade...preferably bright shade with dappled sunlight. The metamorphosis of this plant as it climbs is amazing. The tropical leaves can grow 18 inches long or more, with dangling rope-like stems so thick even Tarzan might be tempted to take a swing. Because it wants to climb, give it a wide berth as a groundcover. 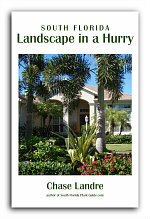 Don't plant too close to shrubs or it will grow up and into them. Keep it trimmed away from nearby trees if you don't want it to climb. 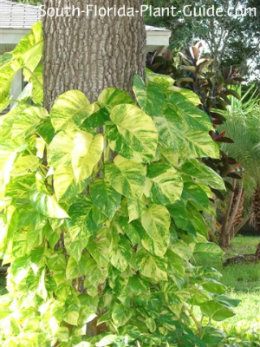 Pothos likes growing up trees like oaks that have rough bark, though it won't hurt the tree. It will even decorate the trunks of palm trees. This plant contains toxins that can affect pets that munch on plants. Pothos is a fast grower that likes partial to full shade. It does best in Zone 10 but can be grown in Zone 9B in containers to be brought indoors during winter. This plant is drought-tolerant once established, though it benefits from well-timed regular irrigation. Add top soil or organic peat moss to the hole when you plant, especially if the area is very dry and sandy. 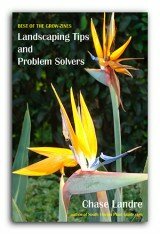 Keep the planting area edged to keep the groundcover in bounds. If you're growing this plant as a tree climber, just cut off any drooping stems that are in the way. 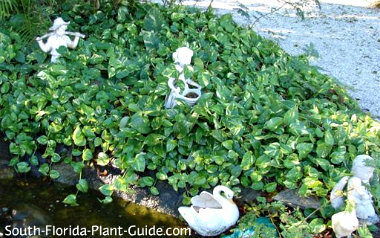 Place these plants 2 to 3 feet apart. Come in from walks and drives 2 feet. This makes an excellent container plant, draping over the sides of a hanging basket or as a cascading surround for a taller center plant. It also makes a great easy-care, air-cleaning houseplant for your home or office. 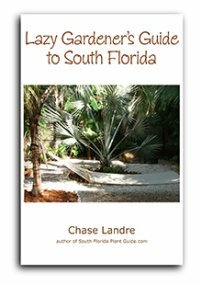 COMPANION PLANT SUGGESTIONS: Nearby plants for a part shade location might include chenille plant, false aralia, blue porterweed, dwarf tibouchina, and coontie.